This report evaluates both the general state of the national debate over pensions and the specific effects of the partnership between the Pew Charitable Trusts’ Public Sector Retirement Systems Project and the Laura and John Arnold Foundation. Finding: Conservative activists are manufacturing the perception of a public pension crisis in order to both slash modest retiree benefits and preserve expensive corporate subsidies and tax breaks. States and cities have for years been failing to fully fund their annual pension obligations. They have used funds that were supposed to go to pensions to instead finance expensive tax cuts and corporate subsidies. That has helped create a real but manageable pension shortfall. Yet, instead of citing such a shortfall as reason to end expensive tax cuts and subsidies, conservative activists and lawmakers are citing it as a reason to slash retiree benefits. Finding: The amount states and cities spend on corporate subsidies and so-called tax expenditures is far more than the pension shortfalls they face. Yet, conservative activists and lawmakers are citing the pension shortfalls and not the subsidies as the cause of budget squeezes. They are then claiming that cutting retiree benefits is the solution rather than simply rolling back the more expensive tax breaks and subsidies. 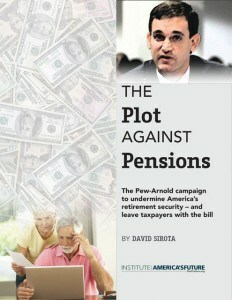 According to Pew, public pensions face a 30-year shortfall of $1.38 trillion, or $46 billion on an annual basis. This is dwarfed by the $80 billion a year states and cities spend on corporate subsidies. Yet, conservatives cite the pension shortfall not as reason to reduce the corporate subsidies and raise public revenue, but instead as proof that retiree benefits need to be cut. Finding: The pension “reforms” being pushed by conservative activists would slash retirement income for many pensioners who are not part of the Social Security system. Additionally, the specific reforms they are pushing are often more expensive and risky for taxpayers than existing pension plans. Whether “cash balance” schemes or 401(k) style defined contribution plans, many of the pension “reforms” being championed by conservative activists risk incurring more costs and increasing risks for taxpayers. Finding: The Pew Charitable Trusts and the Laura and John Arnold Foundation are working together in states across the country to focus the debate over pensions primarily on slashing retiree benefits rather than on raising public revenues. Pew’s Public Sector Retirement Systems Project and the Laura and John Arnold Foundation are working in tandem on public pension policy to manufacture the perception of crisis and press for cuts to guaranteed retirement income. This campaign has played an integral role in states passing legislation that cuts guaranteed retirement income – all while those states preserve more expensive corporate subsidies. Finding: The Laura and John Arnold Foundation is run by conservative political operatives and funded by an Enron billionaire. John Arnold is an Enron billionaire whose only major experience with pension management was his role in a company that decimated public pension funds. Well-known conservative political operatives and consultants run his foundation. Finding: The techniques used by conservative activists to gain public support to privatize the public pensions that public workers have instead of Social Security are, if successful, likely to be used in efforts to privatize Social Security in the future. The current campaign to slash public pension benefits has relied on many of the same PR strategies as President Bush’s earlier campaign to privatize Social Security. In that sense, the campaign against public pensions is an exercise in perfecting methods that manufacture the perception of a crisis – and then result in cuts to guaranteed retirement income. If the state-based crusade against public pensions is successful, it will probably fuel a renewed effort to privatize Social Security. This report was commissioned by the Institute for America’s Future (IAF), a nonpartisan 501(c)(3) research and education institution devoted to new thinking and progressive economic ideas. This report benefited from resources, information, data and research from (among others) the National Public Pension Coalition, the Center for Economic and Policy Research, the Institute for Taxation and Economic Policy, the Center for American Progress, the Economic Policy Institute and Good Jobs First. The author, David Sirota is a journalist, nationally syndicated newspaper columnist and the bestselling author of Hostile Takeover (2006), The Uprising (2008) and Back to Our Future (2011). Sirota’s research assistant on this project was journalist Zaid Jilani.